Tis the season… for new Chilean wine releases that is. 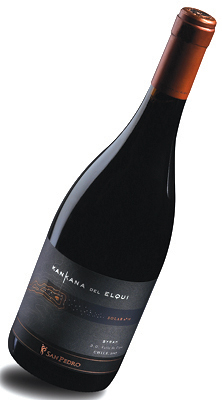 Viña San Pedro launched the latest results of its “Origins Project” last night: Kankana del Elqui Solar Nº 10 2007 Syrah, and I’ll tell you right up front: es una delicia… Even if you don’t speak Spanish, it should be easy enough to understand that this is one delicious wine. I originally planned to tell you the back story, that this is a cool-climate Syrah from an increasingly important denomination of origin (appellation) at the edge of the desert (Elqui Valley), about the climate and the soil, about where the name Kankana comes from (indigenous name for a mountain nearby), the story behind the label design, but no. We can get to all that wine-geeky stuff some other time. Wine is about pleasure, so a wine review should start there. So I’ll tell you what you really want to know first, and then we can all go about our day and I’ll come back and tell the rest of the story later. Viña De Martino’s 347 line is named in honor of the winery’s work done in 347 vineyards throughout the country. This is my favorite of all of De Martino’s 347 line. Maybe it’s because of the 70% fruit from Choapa. To date, De Martino is the only winery putting the Choapa Denomination of Origin on their labels. No wineries proper have come forward yet, but De Martino is working with some producers who are picking some amazing fruit out of there. What this wine’s got going for it is tons of blueberry and cranberry fruit backed up by a bit of dark chocolate and deliciously smooth tannins that are kept in shape by just the right measure of acidity to keep the juices flowing and leave you eager for another glass. This is the good stuff.